Dredging and reclamation works for gas processing plant (GPP) at Yanam. Develop and build a Gas Processing Plant (GPP) for Gujarat State Petroleum Corporation (GSPC). Reclaim land acquired for Gas Processing Plant through hydraulic filling of sand..
DDIL depolys Ta-Hsing having a dredging capacity of 20,000M3 per day with a cutter power of 1200 KW and the dredged material transported hydraulically to the reclamation area. •Dredging suitable fill material and reclaiming 54 Hectares land. Dredging quantity is 2.5Million M3. 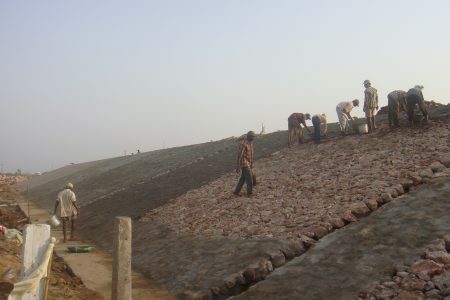 The aquaculture land is levelled and internal dykes constructed to make sand settle in the area. Dredged material is transported through pipeline to a distance about 4Kms and filled at the reclamation area with the desired grade of sand sourced from the Gautami-Godavari river through dredging. Levelling of the filled in areas with Dozer to the designed level for installation of prefabricated vertical drains (PVD). Prefabricated Vertical Drains(PVD) (Membra drain MH88) installed for attaining faster consolidation. Based on soil available at reclamation area, PVD installation is up to a depth of 12m from the ground level in a triangular pattern of 1.5m grid. 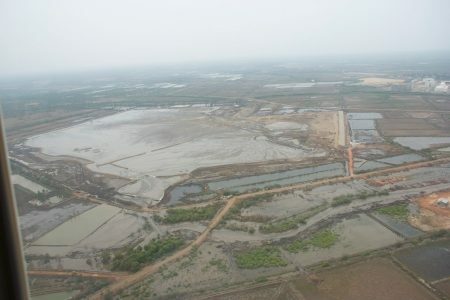 A Peripheral bund is constructed for a length of 4.2 Kms all around the reclamation area using dredged material. 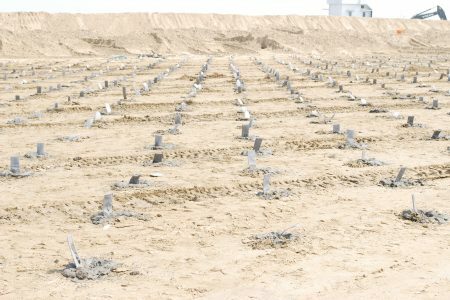 Bund is constructed for consolidating the fill material to obtain 90% of maximum laboratory dry density of the soil by compacting the material using Vibro Rollers. Polyfelt TS30 Geotextile used at the bottom and Plyfelt PEC 100/100 Geotextile used at the slopes of the bund. 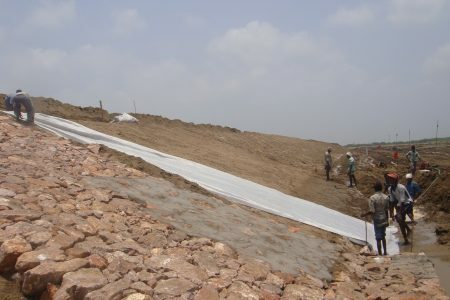 300 mm stone thick pitching on outer slopes of the peripheral bund after filling 500mm good earth on the slope Geotextile. Constructing a Toe wall of 1m thick and 1 m wide at the toe of peripheral bund..
DDIL completes project as per schedule by maintaining the quality, HSE standards.